Famous cricketer Yuvaraj’s brother Zorawar Singh seems to have got into big trouble. Reports suggest that his wife Akanksha Sharma plans to file a domestic violence case against him. 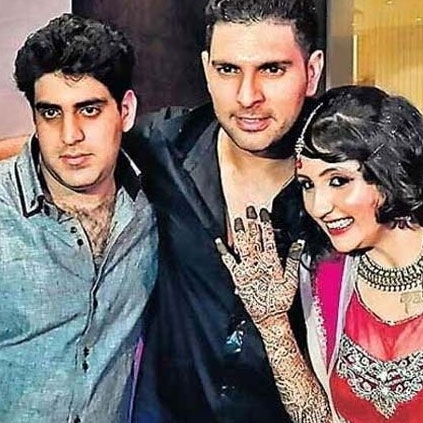 Akanksha Sharma, Yuvraj’s sister-in-law, came to limelight through a popular reality show. Allegedly not everything is going right between Akanksha and her husband, Zorawar Singh. Apparently, she has also filed for a divorce. But the big issue now is that Akanksha is supposedly planning to file a domestic violence case against her husband. When the media asked the lawyer about the physical abuse part, "Well, not black and blue but she was definitely slapped and pushed. There was domestic violence on emotional and financial grounds too. Let me elaborate. Akanksha was asked to get up at 5 am and make tea, when there were three cooks in that house. She was not given any money, neither by Zoravar nor by his family for day-to-day expenses." SS Rajamouli gets bothered about fake Box office records! People looking for online information on Yuvraj Singh will find this news story useful.